Henna has been used for thousands of years, to color the hair reddish-brown and to create red-orange body art. It has enjoyed a recent surge of popularity in the U.S. as a hair color, because it's natural and free of the chemicals often contained in over-the-counter hair dyes. Enthusiasts claim that henna also restores shine and luster to dry or damaged hair. Though henna hair dye is available in paste form, many people buy henna powder and mix the paste themselves. If you want to go a step further and grind your own henna powder, it's relatively easy to do. Pick fresh henna leaves, and set them out flat to dry in the shade. Henna leaves should not be exposed to sunlight, or they will lose some of their potency. It may take several weeks for them to dry, and they should dry to a crisp, according to the Mendi Styles website. Grind the powder as fine as you can get it, using a mortar and pestle. Be sure to pick out any leaves or stems. Strain the resulting powder through a fine sieve or a muslin cloth. Try to get the powder as fine as you can. Use the henna powder right away, or store it in a sealed plastic bag. Exposure to heat and light can cause it to lose potency. 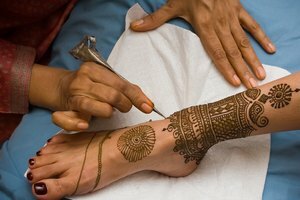 Mehndi Styles: How to Apply Mehndi?